Growing up, I always hated having to layer clothing when it was cold out. I always felt way too hot and super stiff. Never would I have guessed that as I got older, I would love layered clothing, let alone have it on my wish list. Today, I am all about layering turtlenecks. It’s a current trend and I am super supportive of it. One of the main reasons I love layering turtlenecks is that it keeps me warm during cold weather. Going to school in Chicago means I live in winter for about 5 months and keeping warm is a must. With this new trend, I am able to wear clothing during the winter that I would normally wear during the warm months. This is possible because I wear turtlenecks under so many dresses, shirts, and sweaters. For this outfit, I chose a spaghetti strap dress because these types of dresses pair so incredibly well with turtlenecks. The reason behind this is that it allows for a lot of the turtleneck to show, which makes for a great accent. 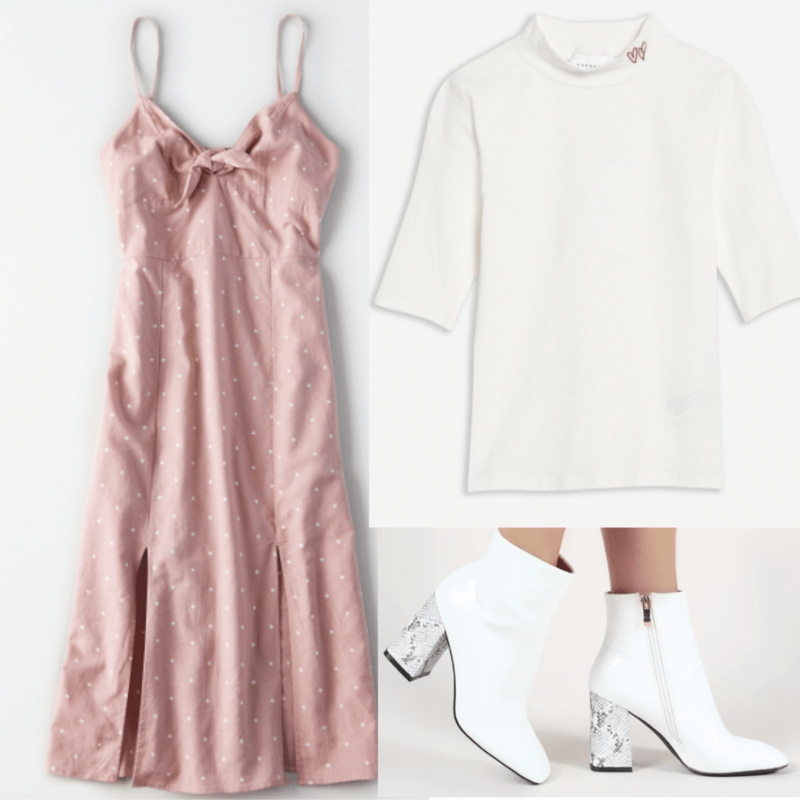 I chose this pink and white polka dot midi dress because it’s fun and flirty. To set off the white polka dots, I paired the dress with a white turtleneck. It’s always a plus when a turtleneck accentuates the details of the piece it’s layered under. To finish off the look, I picked white booties. Obviously, these boots stay within the theme of the white details. I thought the snakeskin heel added a little bit of edge to the outfit in the best way possible. If you aren’t feeling a dress one day, a spaghetti strapped tank top is another great piece to wear over a turtleneck. For this look, I pick out a white simple tank top. I think the heart and “Rolls Royce” text make this shirt so cute. To contrast the plain white of the top, I chose a striped turtleneck bodysuit to wear underneath. The stripes add color and pattern to the outfit. To finish the outfit, I picked grey high waisted jeans. These jeans are a great neutral and can match with almost anything. Turtleneck bodysuits are my favorite types of turtlenecks because they are so easy to layer them underneath anything. There aren’t any rolls or folds that you have to be conscious about when you tuck in your turtleneck, ensuring a smooth line under your other pieces. Another one of my favorite ways to layer a turtleneck is to put it under a cropped sweater. This allows for the neck to peek out from under the sweater and add some color. 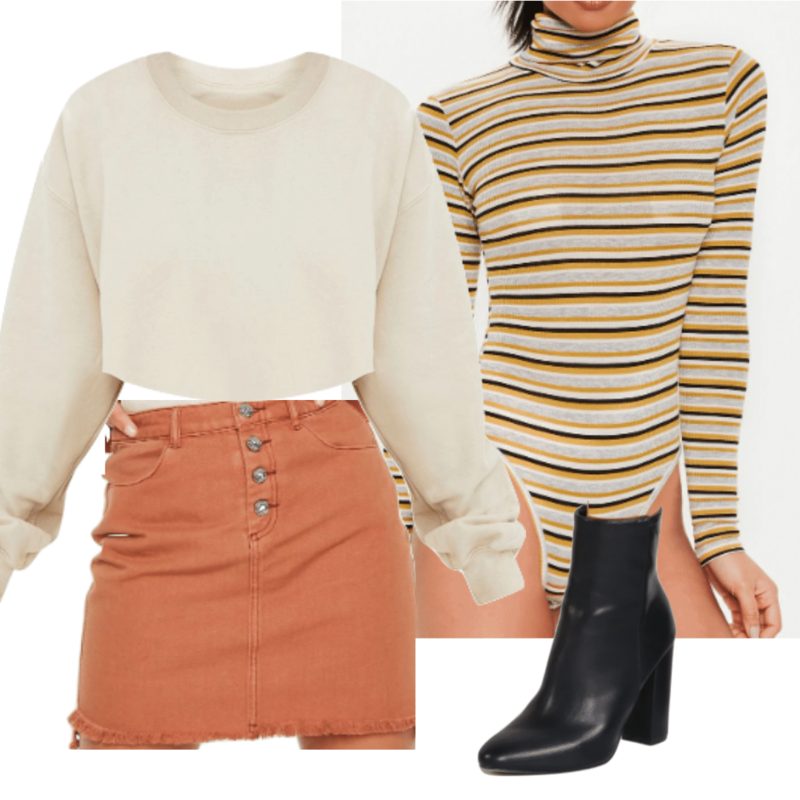 To complete this look I picked out a cream-colored sweater, a grey, yellow, and black striped turtleneck bodysuit, a rust skirt, and black booties. All of these pieces complement one another. The cream of the sweater pairs well with the mustard yellow stripes on the bodysuit. The rust skirt adds a different tone of color to the outfit. And to finish it, the black booties bring out the black stripe in the bodysuit. Overall, there are so many ways to layer a turtleneck. There’s almost no way to go wrong when layering them. Just be creative, have fun and you will look fabulous. Would you layer a turtleneck? Let me know in the comments below!